This tour is for adventurous travelers with open minds who like staying in the traditional houses of the native Albanian highlanders, the “malesore”. The tour covers some of the most scenic parts of northern Albania and includes a world-class ‘Boat Trip on the Spectacular Lake Koman’, a trek through the beautiful ‘Valbona Valley’, and a visit to the ‘Thethi Valley’. You will hike about 6 hours per day and all the overnight stays are in local guesthouses – that also prepare traditional meals. You will get to experience the best of rural Albania, set high in the Albanian mountains, and admire the spectacular view of one of the largest lakes in Europe from the ruins of the Rozafa Castle. Lake Koman: The ferry trip on Lake Koman is an outstanding experience. The lake is narrow and winding, and stretches along the bed of the Drini River. The lake was formed after the construction of a dam in the 80’s. The steep cliffs on both sides create a spectacular landscape reminiscent of Norwegian fjords. Valbona Valley: This is probably the most beautiful valley of Northern Albania. The turquoise waters of Valbona River flow in the middle of a spectacular border of steep mountain peaks. 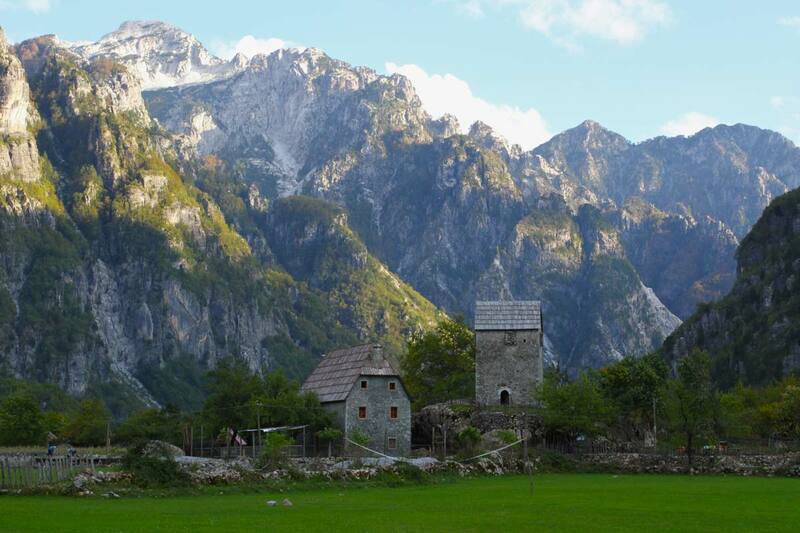 This is the jewel in the crown of the Albanian Alps. 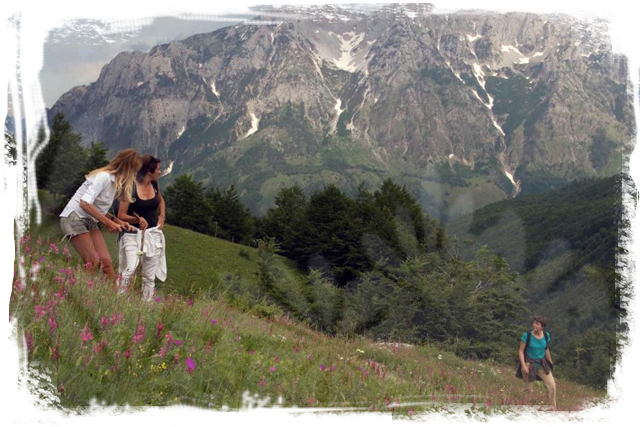 Theth Valley: A hidden paradise in the heart of the Albanian Alps, the Theth Valley is the starting point for all treks to the highest peaks and passes in the region. It leads to Montenegro in the North, Kosovo in the East and the city of Shkodra in the West. 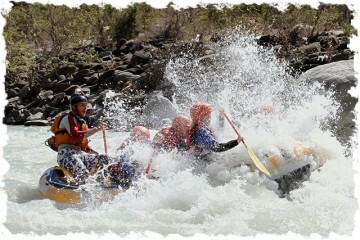 This tour is physically challenging, and demands you to be in excellent physical shape. Normally, the treks are between six to eight hours a day, so preliminary trekking experience is an advantage, but not necessary for those who are in very good shape. During the hikes, you are required to personally carry you own day rucksack. The main luggage will be transported on a mule/ horse or vehicle. The “OA” tours are Land Only; the prices do not include your flight, nor transport to and from the airport to hotel. You must make your own way to the starting point of every tour. Please let us know at booking if you would like us to arrange an airport transfer for you. Children joining this tour should have experience with hiking. 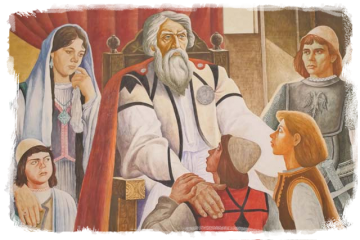 An adult needs to accompany children under 18. Can I book a single room for the local village house trek? On this tour, we use local guesthouses where you share a room up to about 5 persons per room. Therefore with the set departure tours, there is no possibility for booking a single room. It will be possible for private tours and tailor-made tours to book a single room, in in this case we will make sure there are either no other persons sharing the room with you, or we will use small hotels. Our set departure tours do not include the airport transfers, if you wish to book an airport transfer, please mention this at your booking form. The price from the airport to Tirana or vise versa is 30 euro (max 3 pax) and the price from the airport to Shkoder or vise versa is 110 euro (max 5 pax). In case you need a transfer for more than the maximum amount of pax, please contact us for prices. For the local village house trek we need a min number of 5 participants to guarantee a departure. You can can check our departure dates and see what departures are guaranteed. 42 days prior to departure we will let you know if there are enough participants to run a tour, in case there are not enough participants you can either choose to cancel or pay a small group supplement. You will be picked up at 6.30 a.m. from your (central) Shkoder accommodation. 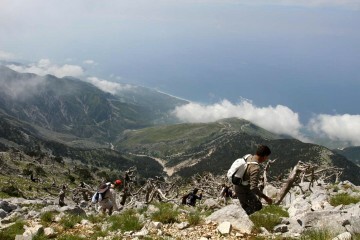 The expected ending of the local village house trek is on day 5, at around 5:00 p.m. in Shkoder. (Please know that these are approximate times, in case you need to be in time for an after tour activity, please let us know at booking). Can I bring my kids along to the local village house trek? Early in the morning we will depart on a scenic drive from Shkoder, to reach the docks in the dam of Koman. The homonymous lake beyond it, was artificially created in the 80’s after the construction of the third hydropower dam that interrupts the canyon of river Drin. Once reached the docks of Fierza, we will stop for a tasty lunch in a traditional restaurant nearby. The trip will continue by car through the narrow valley of Valbona – one of the most beautiful valleys of the Albanian Alps. Our transfer ends in the charming village of Valbona – Rrogam, where we will be hosted in a comfortable local guesthouse. The location of the house is the ideal starting point for all kinds of hikes in the surrounding mountains. Free time to explore the village at own pace, while the steep and jagged limestone peaks above the village are embraced by the sunset light. Our first hike will start from the guesthouse towards the secluded hamlet of Kukaj, with the aim to discover the small hidden valley above the two houses. 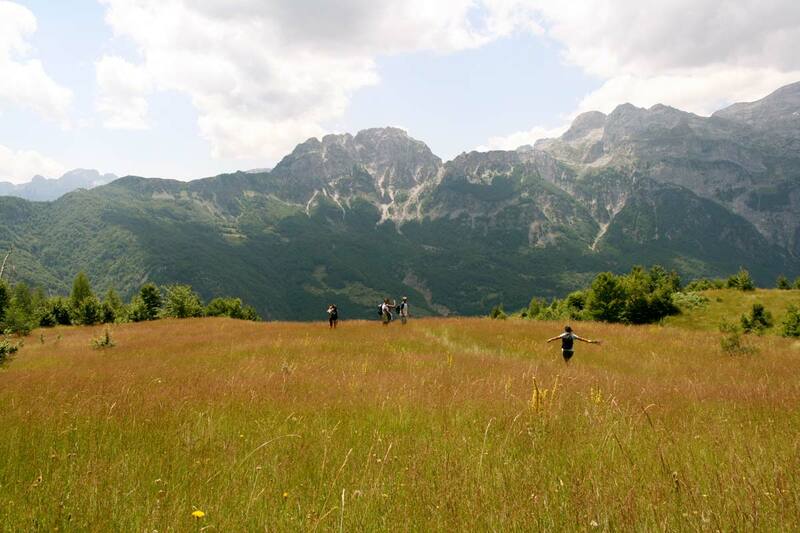 A winding shepherd’s trail through forest, will take us in the middle of green alpine meadows underneath the rocky dome of Mount Rosi, known by the locals as ‘Pllana’ or ‘Buni i Brahimit’. Here we can have a picnic lunch and admire the dramatic peaks of Grykat e Hapta across the valley, and Jezerca the highest peak of the Albanian Alps, towering above the steep couloirs of Paplluka mountain. We can also have a chat with the friendly shepherds who often graze flocks of sheep and cows in the meadows in the summer months. 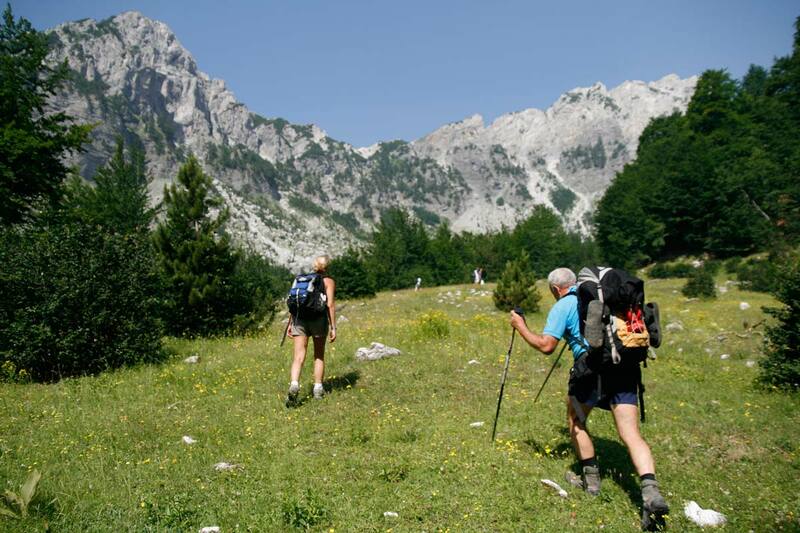 The walk can be extended further to reach the pass Qafa e Rosit (2000m) that marks the border with Montenegro, and gaze at the spectacular Accursed Mountains at sight. On the way back we will stop for mountain ‘çaj’ at the wooden terrace of one of the houses, before returning to the guesthouse in Valbona for dinner and overnight. The walk to the meadows and back lasts approximately six hours that can become eight with the Qafa e Rosit extension. Today we hike on a ‘classic’ trail of the Albanian Alps that for centuries connected the glacier valleys of Valbona and Theth via the 1860m high Valbona Pass. The pass becomes possible to cross on foot from the end of May, when the snow melts enough to let people and animals through. Indeed, we will use horses to carry the luggage to the next guesthouse, and start walking towards the end of the valley. Once past the last houses of Rrogam, the trail steepens up towards a plateau sided by rough slopes and a winding narrow trail that leads to the Valbona Pass. On clear days the col is a superb panoramic spot from where to admire the jagged peaks of ‘Bjeshket e Namuna’ – the Accursed Mountains. We than start to descent towards the village of Thethi (850m), again passing through dense woods and grassy meadows where we will stop for picnic. 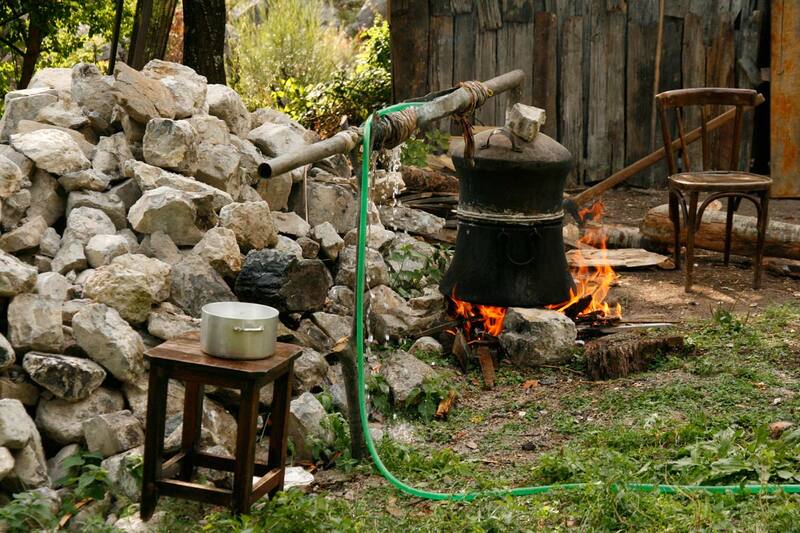 In the afternoon we will relax in Thethi, the best-preserved alpine village of Albania. We will stay overnight in one of the traditional houses and enjoy the extraordinary hospitality. We will walk down from the house (850m) and visit the attractions of the village, including the Church, Kulla e Ngujimit (a tower house used in the past by men as a shelter against ongoing vendettas), the Waterfall of Thethi, and peer at the rocky narrows of the Grunasi Canyon from the wooden bridge of Grela. Near the canyon are found stone-walled terraces dating from the late bronze era, revealed only in 2007. After the picnic lunch, we continue walking along the Shala river, until the serene hamlet of Nderlysa – our next overnight stop. The nearby turquoise pools of the Kaprea creek, are the perfect spot to relax amidst nature in the afternoon, before a tasty traditional dinner is served in the guesthouse. Our last day starts on foot through the remote and wild valley of Kaprea. We will pass by the Blue Eye pond, filled by a small waterfall in the middle of lush vegetation, and then continue uphill on our trail in forest in order to access the upper meadows that will lead to the pas of Thore – located at 1670m of elevation – where our trek ends. The views on this walk are truly rewarding, and we will continue to enjoy the alpine landscape also during our picnic lunch in a panoramic spot at the pass. Later, we will start driving through the equally stunning valley of Boga that will be our exit gate from the Albanian Alps, as we make way towards the Shkodra Lake and town. Based on your travel plans, you can either decide to stop your trip in Shkodra or in Tirana (with additional request).